How did the Protest today go At the head of scientology Ireland?Middle abbey st? BELGIAN federal prosecutors are preparing to bring charges, including fraud and extortion, against the Church of Scientology as a "criminal organisation", according to press reports. Charges of fraud, illegal medicine, breaches of privacy and extortion have been drawn up against the church and two senior executives, 'De Tijd', Belgium's financial newspaper, has reported. Early this week the FBI received a formal complaint against Scientology, citing several alleged crimes, including, but not limited to exploitation of a handicap, interstate deceptive telemarketing, misleading marketing practices, fraud, and conspiracy to commit fraud. This complaint followed on the heels of a recent report filed with the Canada Competition Bureau for similar alleged crimes over a twelve year period. FORMER members of the Church of Scientology will hold a conference in Dublin next month to highlight the impact the movement has on followers. The organiser is Pete Griffiths, a former director of an English Scientology mission, who says he has informed police at Dublin airport Scientologists may stage protests there against speakers arriving for the event. A FRENCH appeals court has upheld fraud charges and a €600,000 fine against the Church of Scientology for cajoling followers into paying large sums for bogus personality tests and cures. Rejecting the church’s appeal against a 2009 ruling, the court said two French branches of the US-based organisation were guilty of “organised fraud” and gave four of its leaders suspended jail sentences of up to two years. First of all I am still very new to all of this and i do not know as much as people like TheMadHair or Spete. But here is why I do it. The Church of Scientology is appealing a French court ruling that found it guilty of fraud for fleecing vulnerable followers and fined it hundreds of thousands of euros. The 2009 conviction saw Scientology's Celebrity Centre and its bookshop in Paris, the two branches of its French operations, ordered to pay €600,000 in fines for preying financially on several followers in the 1990s. 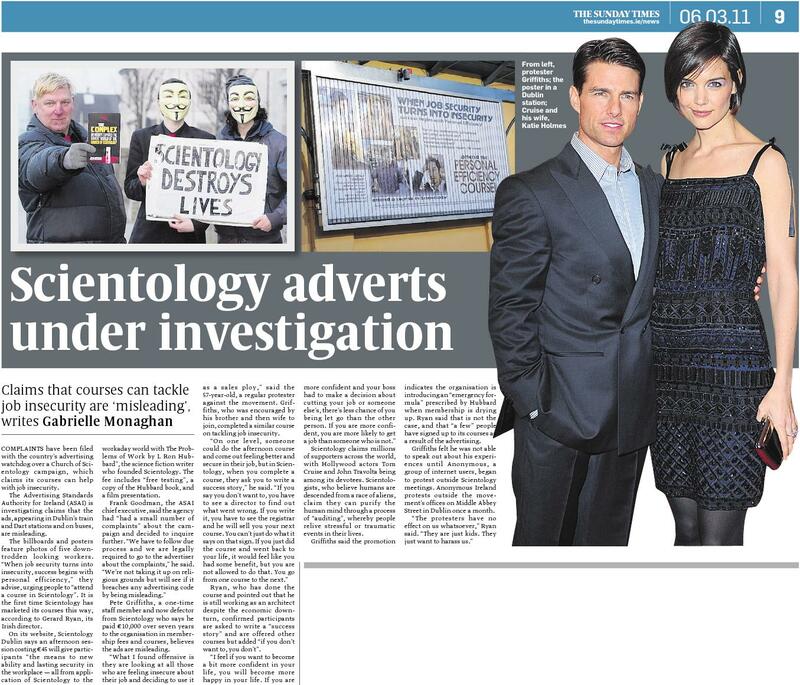 REVENUES HAVE plummeted at the Irish branch of the controversial Church of Scientology, which remains deep in the red. Membership of the worldwide church, established in 1954, includes movie stars such as Tom Cruise and John Travolta. However, documents show that interest-free loans from abroad are propping up the Irish branch, which is more than €688,000 in the red in its latest accounts. THE Church of Scientology in Dublin could be struck off for failing to file company accounts, the Irish Mail on Sunday can reveal. The Irish office has failed to file accounts for 2009, which were due in January 2010. Last year's accounts are now also late and a strike-off notice was sent to the church's directors on June 3. If accounts are not filed within two months, the church's assets will be transferred to the State. The Scientology-backed rehab promises addicts they can sweat out their demons in sweltering saunas. But critics charge that the organization is the devil itself. If these guys were in a Narconon sauna, they'd have even less to smile about. SCIENTOLOGY bosses are trying to brainwash vulnerable people to get at their cash, an undercover Irish Sunday Mirror investigation reveals today. We went behind the scenes at the secretive religion's four-hour long Personal Efficiency Course last week. Our aim was to discover just what goes on inside what experts call the biggest cult in the world. A recent campaign in Dublin advertised courses run by the Scientology movement. Members past and present tell Cian Traynor about their experiences of the organisation. Does it bring the promised prosperity, intelligence and freedom, or simply exploit the vulnerable? This Sunday, one hundred years ago, the founder of one of the world's most contoversial religions was born in Nebraska. L Ron Hubbard founded The Church of Scientology - an organisation which for the last 60 years of its existence has attracted criticism and praise in equally strong measure. From the Church of Scientology in Montreal, Jean Lariviere refers Narconon Trois-Rivieres Director, Sylvain Fournier to, “Please check what LRH says about dealing with a Black Panther!” A Rush-Urgent was titled in the subject. LRH is non-other than the science fiction writer, Ron L. Hubbard, the founder of the Church of Scientology. Complaints have been filed with the country’s advertising watchdog over a Church of Scientology campaign, which claims its courses can help with job insecurity. someone created this Ning Network.